ROUND six sees many AFLW stars line up for rival clubs in the Victorian Football League (VFL) Women’s, as many teams look to record wins after the bye. Two ladder leaders in Geelong and Darebin will go head-to-head while the Bulldogs will hope to secure their first win against the Seagulls. 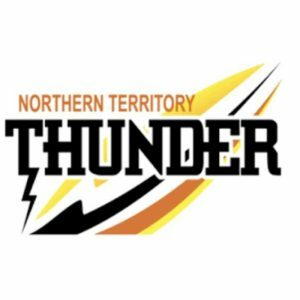 After last week’s bye round, Carlton and NT Thunder will be raring to kick off round six. The Blues have made four important changes to their line-up, welcoming back AFLW players Reni Hicks and Shae Audley alongside Sarah Last and Oakleigh Charger, Isabella Geitzmann. They will take the place of Bridie Kennedy and Sarah Hosking as well as Kate Shierlaw and Madeline Keryk, who have both taken up opportunities at other clubs. The undefeated Thunder will introduce six new faces to RAMS Arena on Saturday as part of ten changes for its round six side. One of these debutants is Amy Chittick, a four-time Northern Territory Football League (NTFL) premiership player for Waratah. PINT junior, Katie Streader and Wanderers junior, Lauren Motlop are also exciting new inclusions. The last two newcomers to don the Thunder guernsey this week are Adelaide Crows 2017 AFLW premiership players, Courtney Cramey and Jenna McCormick. Their knowledge and experience is sure to bring class to the Thunder’s game. Joining them will be Sarah Allan, Sophie Armitstead, Chelsea Randall and Emma Swanson. 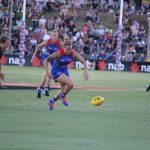 In their clash with Williamstown this week, the Western Bulldogs have made some key changes to ensure their best chance at victory. They will welcome back Bulldogs AFLW premiership players, Kim Rennie and Hayley Wildes as well as Melbourne listed AFLW player, Alyssa Mifsud, who comes in for her first game with the Dogs. This brings their tally to eight AFLW listed players for the round, hopefully giving them the edge they need to secure their first win of the season. Williamstown have named six changes for their round six side. The Seagulls will be glad to welcome back their captain, Sarah Chapman this week now that she has recovered from injury. Isabelle Porter has also been recalled to the field after returning from injury. Williamstown have named Bendigo Pioneers captain, Megan Williamson as the 23rd player. Emma Ludolff, Kaitlin Smith and Anna Saxton have been sidelined. Geelong is currently sitting at the top of the VFLW ladder with a few teams hot on its toes, including this week’s competitor, Darebin, who will be looking to secure its fourth win for the season. The Cats will be going into the match without their 2017 leading goalkicker, Kate Darby as well as influential players in Renee Garing, Evelyn Dhamarrandji, Sachi DeGiacomi, Krista Woodroffe and Bianca Cheever. In their place Geelong have named six ins to take on Darebin including the likes of AFLW player and former elite netballer, Erin Hoare. 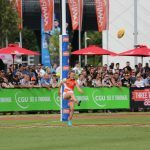 Fellow AFLW talent, Anna Teague will also join the side this week alongside Georgia Watson and Emma Oliver. Madeline Keryk will take the field in the blue and white for the first time after moving from Carlton. North Geelong junior, Ruby Benham has been named as the 23rd player. Darebin will be excited to welcome Kate Shierlaw to their side this week following her move from Carlton. She will take to the field alongside Western Bulldogs premiership player, Aasta O’Connor, Tamara Olcorn and Cherelle Byrne. AFLW players, Nicole Callinan and Lauren Pearce will miss the round six clash. Hawthorn will take on the Southern Saints this Sunday with five team changes. The impactful AFLW player, Melissa Kuys will be an important inclusion to the Hawks line-up and will be called into the round six clash with Julia Crockett-Grills, Sarah McNamara, Ellie MacDonald and Samara David. They will take the places of Tahni Nestor, Lauren Costello, Kara Henderson and Sarah Yule. The Southern Saints will go into round six with an exciting addition to their team with the experienced Lauren Arnell pulling on the red, white and black guernsey for the first time. The former Blues captain ans newly listed Brisbane player will make the move to the Saints and is sure to bring poise and leadership to the side. Eastern Ranges player, Ashleigh Allsopp has been named as the 23rd player. Richmond and Melbourne Uni will meet in Bendigo this weekend with the Tigers making two changes to their line-up. New Greater Western Sydney (GWS) forward, Christina Bernardi will be a welcome addition to the team as well as Kate Dempsey. Richmond have yet to name who will take to the sidelines. In search of their second win, Melbourne Uni will employ the likes of Kaitlyn Ashmore and Danielle Hardiman, who are both recent signings to North Melbourne’s exciting 2019 AFLW list. They will be joined by fellow Kangaroos recruits, Jamie Stanton and Jasmine Grierson. Prudence Cordes and Millie Shone have also been named to take to the field, while Stephanie De Bortoli and Nicole Bresnehan have been named out. SEESAWING contests and surprising victories headlined an action-packed round three. 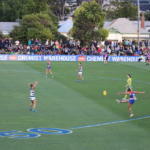 Melbourne stumbled at Fremantle Oval against the Dockers, who continue to rectify their disappointing start to the season, while the reigning premiers welcomed back superstar, Erin Phillips, who got her side over the line for their first win of the year. At Ikon Park, Lion Nat Exon ran amuck against her old side, who struggled without captain Brianna Davey. For the Pies, they sit winless at the bottom of the ladder, and are under pressure to kick-start their 2018 campaign. Absolute bull. Worked well under pressure. Nearly beat three Carlton players to the ball at one point. Got plenty of the ball throughout the night and kicked a ripper goal to sink her old side. Her best game in Brisbane colours. Brilliant performance. 18 disposals including 14 kicks. Knows how to use the footy. Ball magnet as usual. 16 disposals, in which 10 of them were kicks. So smart with the ball in hand. Aggressive as usual. Imposed on the ball with 13 disposals. Smart in defence and good run-and-carry. Never rushes her kick. Tackling was outrageous! 10 tackles to go with 10 disposals isn’t a bad night out. She’s the person you’d want kicking for your life from the boundary. Kicked a ripper at the beginning of the third quarter. Stood tall in defence and took three early marks. Has a booming kick and a great ability to smother the footy. Was proactive in defence. Didn’t stop trying all night. Deserved a goal but couldn’t convert on what should’ve been a gimme. Opened up the play by playing along the boundary and wider parts of the ground. Took four impressive grabs and kicked two goals. Really good pressure player. Showed intent throughout the whole game. A third-quarter clearance exposed us to her immense pace. Got plenty of the ball in defence. Her best game for the year. Good, hard running all game. Such an aggressive player. Was all over the ground. Took some killer marks, just not in the forward line. Kicked a good left-to-right goal. Was active with the footy, collecting 12 disposals. Calm and composed in defence. Straight down to business after taking a mark, always looks for the best option. Solid captain’s game again. Only nine disposals but laid five tackles. Really wanted to get involved in the pressure side of the game. Had 14 disposals but could not kick a goal. Tried hard all night. Played really tight on Tayla Harris and kept her quiet. Forced her up the ground. Made Harris frustrated, as she gave away two free kicks in quick succession. Unbelievable in her first game of the season. Played a huge part in getting the Crows on the board, kicking four goals from six opportunities. Dangerous with ball in hand all day, constantly creating scoring chances, and intimidating the Bulldogs defence. Great game across the board, with over 20 possessions. A number of those set the Crows up for forward attacks. Displayed relentless pressure, and was the leading tackler on the ground, laying an astounding 15 of them! One of the best players of the day. Terrific contest with Katie Brennan when she pushed up into the midfield. Leading possession-getter on the ground with 24, and stood up when it mattered most. Solid game in all areas of the ground. Accumulated 15 possessions, and put in a tremendous effort in the final minutes, but could not quite get the Dogs over the line. Opportunistic first goal. Should have had more than just one, missing two shots on goal later in the game. Was a key contributor for the Dogs. Played a great game with 17 possessions and a behind, but just couldn’t snag a major. Provided good run through the midfield, and looked dangerous up forward. Continued what has been a terrific start to the season. The small forward took advantage of the opportunities coming her way with 16 possessions and a goal. Quiet day at the office numbers-wise, but was still able to have an impact on the game. She laid six tackles, including a clutch tackle in the dying minutes to set up the winning goal. Played her way into the game after a slow start. Ended up kicking two goals, but overall was held in-check well by the Crows defence and midfield. The early move into the middle of the ground allowed her to find some form after a disappointing first two games. Moved back up forward in the second half, and registered a minor score. Continued to build on what has been a good start to the season. Kicked two goals for the Crows from her seven possessions. Good composure down back to fend off a number of the Bulldogs’ scoring opportunities. Provided a tough contest across the back-line. Got off to an excellent start with a lot of the ball early, including a goal in the first term. Was held down well for the remainder of the game. Spent some time in the ruck throughout the day but was beaten by Rhiannon Metcalfe. Racked up eight possessions for the day through moving around the ground. Another good outing down in defence, which was under constant pressure. Laid a number of tackles, and showed good composure with ball in hand. Played a solid game with 11 possessions. Impactful in a number of key moments down the stretch to set up a victory. So aggressive around the contest. Gogos was the Bulldogs’ leading tackler, with 10 for the day. Presented a strong target, taking three marks. Accumulated eight possessions, and showed positive signs through her effort around the contest. Was reported in the first quarter for a hit on Ellie Blackburn. Physicality was on display all day, and was something that seemed to inspire her teammates. Got the better of the ruck battle throughout the day with 25 hit-outs, a number of those to advantage. Not much impact outside of the ruck contests, with only three touches. She had a stellar game with plenty of possessions, and a goal-saving smother in the second quarter. Showed great desperation and commitment, going hard at the footy and putting her body on the line. Her tackling was intense, yet she had great composure in front of goal, slotting two majors. Her kicking game was on show with 20 of her 23 touches being kicks. She had clean hands and showed great poise and decision-making with ball in hand. Great on-field leader. The captain was unstoppable once again with 15 disposals. She racked up 10 kicks for the game which were long, penetrating and accurate. Her intensity and aggression around the ground was felt, laying six tackles and imposing herself in the contest. She took plenty of good contested marks around the ground, and imposed herself on the contest throughout the match. Skilful use of the footy, and slotted an extraordinary goal in the first term. She used her speed and agility throughout the game to manoeuvre herself into dangerous positions and rack up plenty of the footy. Dominant in front of goal and used the footy cleanly and accurately. Showed good awareness and skill with ball in hand. Took good contested marks and showed plenty of composure, slotting the match-winning goal. Great on-field leader. Got plenty of disposals and displayed good decision-making. Dished the ball off cleanly to teammates. Impressed again for the Pies, racking up 19 disposals. Her tackling intensity was up, laying six tackles for the match. She made her physical presence felt with her 11 touches, and used her poise to control the flow of the game. Good speed. Belter of a first quarter, as she imposed herself on the contest from the outset. She tackled aggressively and chased down opponents, placing pressure on GWS. Got plenty of the ball with 12 touches. Showed great composure to score an important goal late in the last quarter. Scrummed hard to win the contested ball and provide opportunities for teammates. The Collingwood captain stood tall again, bagging an important goal in the first quarter. She had clean hands around the footy, and kicked the ball with penetration. Starred in the last quarter providing plenty of run and carry, helping to break up the congestion on the field. She also took a few intercept marks and racked up 14 touches, with 11 of those being kicks. She was accurate in front of goal. Helped to spark the onslaught for GWS with her forward pressure and leads to the footy. Hit the contest hard on the ground and in the air. Her tackling pressure was intense, laying four tackles for the game. Got involved and competed for the ball in and around the contest. She was her ever-reliable self, taking important intercept marks and racking up 11 touches. Good on-field leader for the Pies. She found some impressive form after being dropped from the team. She slotted two skilful goals; one around her body and another dribbling through the goals. Her bag of tricks was on display with clean pick-ups and classy finishes. Imposed herself in contests and fought hard to try and win the contested footy. Copped a nasty hit to the face but played out the rest of the match, showing her mental and physical toughness. Ran hard and opened up space for the Pies. Supported her teammates, through providing them with leads and options. Scored an important goal late in the third quarter. Got herself into space and contested for the ball. She made her physical presence felt laying three big tackles. Showed great speed. Clean pick up of the footy. Good footwork to move herself around opponents. Great eyes in traffic to be able to spot teammates in space. Took responsibility and went to Pearce to try and nullify her impact in the last quarter. Took the match-saving mark in the dying seconds, which shows why she was named captain of the Dockers. Showed Dusty-like traits with a ‘don’t argue’ on a Fremantle opponent! Dominated the middle of the ground with a game-high 24 disposals. A complete captain’s game. She had the skill and composure to convert a set shot in the third term on a relatively hard angle. Continued to impress in her debut season, with 17 disposals and four marks. She is not scared to go back with the flight and take a gutsy mark. Puts her head over the ball in the contest. Has a great set shot for a defender, and kicked a beautiful goal in the second quarter. She has a fantastic goal-sense and showed tremendous skill on debut. Finished with two goals for the game, and created a buzz in the forward line. She had free reign inside 50, and showed Richelle Cranston-like attributes. Wasn’t just influential in the middle of the ground, but was also able to go forward and take a contested mark, and convert from close range. Good intercept marker, and great intent on the ball. She was buzzing around the packs. Able to manhandle her opponents to get her hands on the ball. Being 186cm tall and having a basketball background gives her a supreme advantage over her opponents. She also has a good goal-kicking technique. 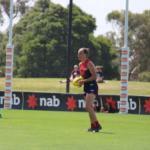 She is able to chip in the ruck, which is very valuable for the Demons. Began where she left off last week with a lively start. Made an impact in the contest and racked up 13 possessions. She has great speed, and executed some impressive run-down tackles in the first quarter and second quarters. Appeared to be everywhere, and contributed nicely on the day. She has good rebounding speed and a penetrating kick. Was very determined to find the footy, and looks like she is benefiting from complementing Bianca Jakobsson in the back-line. Great pace and acceleration shown throughout the day. Did the little things right. Racked up 12 disposals, of which 11 of those were kicks. Her effort could not be questioned, as she showed impressive intent all day. Accumulated 11 possessions. Her tackling was a highlight for the Dees, laying seven for the day. Impressed again with 11 disposals, and did the job that she needed to do. A rare brain fade for her in the dying minutes, as she rushed and missed an easy shot on goal. She beat Jakobsson inside 50 to kick an amazing goal in the final quarter. Has immense speed and class, and showed that to kick her third goal of the season. Miller has a huge kick, and can mimic Tayla Harris’ scissor kick! A promising 16 disposals for her in another great outing for the Dockers. Loves to take her opponents on and break through tackles. Had a big influence on the match, with her big body being a roadblock for Melbourne. She has great explosive speed, and has the ability to push her opponent under the ball. She is hard to catch, which was evident with her soccer goal in the third quarter. She lead up to the ball all day, and took some nice marks on the lead. Never gave up and kept presenting. She puts the team first, and loves the one percenters. She has a team-first attitude, and loves to tackle and smother. In the third term, she had good skill and composure to finish nicely with a goal on her left foot. JUST when it looked like certain teams were starting to get ahold of the competition, the three undefeated sides all suffered losses to signify just how close the AFLW is this year. The Western Bulldogs, Melbourne and Carlton all tasted defeat, while Collingwood remained the only side without a win after going down to GWS. Adelaide was seeking to salvage something from its disappointing start to the season against the in-form Western Bulldogs. In a come-from-behind win, the Crows claimed their first scalp of the season, winning against the undefeated Bulldogs. With a lacklustre start to the 2018 fixture, the Crows pulled out all stops to help secure their first hard-fought win, claiming victory by seven points. The naming of Erin Phillips was a moment that many Adelaide fans, and football fans in general, had been waiting for. In her long-awaited return, the superstar proved to be the missing piece in the Crows’ winning formula, slotting four goals and racking up 15 disposals. In recent weeks Adelaide had missed Phillips’ class and football know-how around the ground. Her excellent decision-making and ability to understand the play allowed for her teammates to fulfil their roles with ease. Chelsea Randall has consistently proved to be the hero of this Adelaide outfit, and Saturday was no different, as she racked up an important 21 disposals. 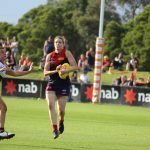 Adelaide United and Crows superstar, Jenna McCormick was also unstoppable with two very important goals. Her final goal secured the first win for the Crows in what turned out to be a close encounter. Bulldogs full-forward, Katie Brennan continued to star for her side, scoring two goals and laying five tackles in their loss to the Crows. Her tackling pressure was second to none, and she made sure that her physical presence was felt around the ground. Former Calder Cannon, Monique Conti impressed again, amassing 15 touches at a hot Norwood Oval. Experienced midfielder, Emma Kearney also showcased her footy skills, and was the Bulldogs’ leading possession-getter with 20 touches. Looking ahead, Adelaide are set to play GWS next weekend, while the Dogs face the Blues, who have just come off a disappointing loss to the Lions. After two straight wins, the Blues were searching to remain undefeated and continue to sit pretty on the top of the ladder. But Brisbane had other ideas. The Lions continued their dominance in the competition, as they secured a 22-point win over their undefeated opponents. The away side outclassed the Blues all over the ground, especially in front of goal. Carlton’s impressive tackling was on show again, and Shae Audley led the way with a game-high 10 tackles. But Brisbane was up for the challenge, combating the Blues’ pressure with a defensive wall of their own. The Lions got plenty of players to the ball and trapped the footy within their forward 50. They stopped any forward momentum from the Blues, through laying impressive tackles to help increase scoring opportunities for their dangerous forwards. Young gun and former hockey star, Sophie Conway had another stellar game, bagging two goals. The 18 year-old goalsneak showed her ability to get into dangerous positions and capitalise on her scoring opportunities, keeping Brisbane’s winning streak intact. Teammate Emily Bates also impressed on Saturday night, tallying 20 possessions and going at 63 per cent disposal efficiency. In defence, it was the experienced Kate Lutkins who racked up 18 touches in an impressive outing for the Lions. Darcy Vescio continued her scoring ways, slotting another goal for the Blues in their first loss of the season. Vescio ended up with 10 touches for the game and three tackles, showing the intensity that she brings to the game. Collingwood recruit, Nicola Stevens also continued to dominate, racking up 13 possessions for the game and imposing herself in the contest. In round four, the Blues will face the Western Bulldogs who are fresh off a loss, while Brisbane are playing the Fremantle Dockers. 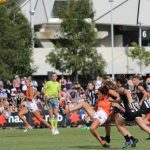 With both teams coming off a round two loss, the game was shaping up to be a highly contested match, as both Collingwood and GWS hoped to secure their first win of the season. In front of their home crowd, the Magpies showed their might in the first quarter, but fell 13 points short of that sweet victory. The Giants took control of the game late in the second quarter, and wrestled it back again in the last quarter to help score their first win for their 2018 campaign. The momentum shift in the second quarter sparked the fightback for the Giants, who looked down and out in the first quarter. GWS’ approach to the contest looked more dangerous, with the players looking hungrier for the ball. The Giants had an increased number of players around the footy, and applied good tackling pressure. 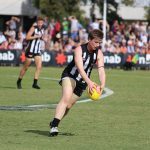 They peppered the goals in the second term with seven scoring shots to Collingwood’s one, placing constant pressure on the home side’s backline. Collingwood sensation, Chloe Molloy had an explosive last quarter showing off her ability to break lines and take important intercept marks. Her run-and-carry was greatly needed, inspiring a few forward bursts late in the game for the Magpies. Melbourne Uni forward, Moana Hope inspired in her come-back game, slotting two impressive goals for the Pies to kick-start her 2018 season. 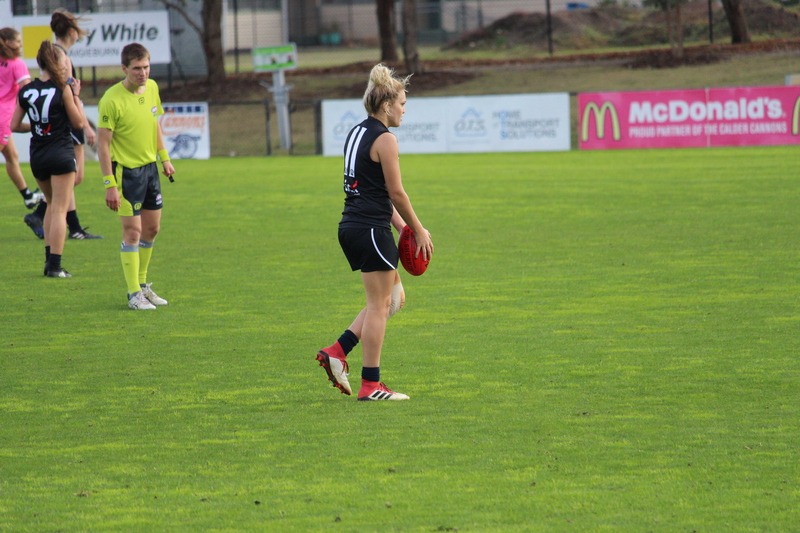 Emma King also stood tall in Collingwood’s loss, taking plenty of contested marks and imposing herself on the contest. GWS forward, Aimee Schmidt starred, scoring the first two goals to open the Giants’ account for the match. Fellow forward, Phoebe McWilliams dazzled yet again, with another two goals and 12 disposals. Playing against her former team, Alicia Eva proved her worth, class and skill, racking up an impressive 23 disposals. Collingwood will face the second-placed Melbourne Demons next week in the Northern Territory next weekend, while GWS play the Adelaide Crows who are fresh off their first win for the season. The Dockers shocked the Demons at Fremantle Oval, claiming their second win of the season. Melbourne had an impressive start to the year, winning its first two games of the year, but Fremantle destroyed their undefeated run, winning by five points. The Demons dominated the contested possessions, contested marks and tackles inside forward 50, but it was Fremantle’s accuracy in front of goal that proved to be the difference. The home side eventually prevailed in a seesawing contest, slotting six goals to Melbourne’s four. Fremantle’s accuracy in front of goal allowed them to take the game away from the Demons, who dominated in most areas of the game. The Demons had plenty of scoring opportunities, with 11 shots to the Dockers’ six, but they were unable to convert them to goals, which left the game open for Fremantle. Even though the Dockers had less opportunities to capitalise with 24 inside 50s to Melbourne’s 34, their potency in front of goal ensured them the win. Fremantle debutant, Emily McGuire played a huge role in their win, slotting two impressive goals. The Swans District recruit started her AFLW career in style, bagging her debut goal to kick off proceedings for the Dockers, and scoring the winning goal for the game. Coastal Titans recruit, Lisa Webb also showcased her class, tallying 17 disposals and laying three tackles for the match. Tegan Cunningham was on fire for the Dees, bagging two goals, and taking plenty of grabs. Cunningham hit the packs hard and contested for the ball in the air, giving her teammates plenty of chances around the ground. Powerful forward, Richelle Cranston also impressed for the Demons with 11 disposals, and plenty of goal assists. Her surge forward helped Melbourne get back into the game in the third quarter. The skill and class of Daisy Pearce was on show again, as she amassed a whopping 24 touches. 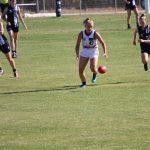 Experienced midfielder, Karen Paxman continued on her merry way, racking up 15 possessions and slotting through a goal in her side’s unexpected loss to Fremantle. Fremantle go on to play the ominous Brisbane Lions next weekend, while Melbourne face the winless Collingwood, who will be searching to redeem themselves after a shocking start to the season.